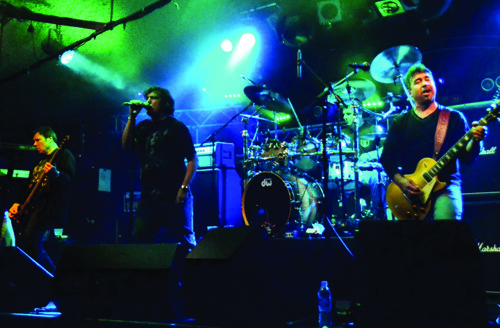 It's certainly true that Z-Rock has had its problems in recent years, with frequent line-up changes, poor attendances and a failure to settle in one venue. However, it's also true that my trusty photographer and I have been to all but one show since it started in the late 90s and have enjoyed each and every one. On the face of it, moving to the well-respected Robin 2 seemed to be a good move because of its good sound, nice size and central location, as well as the good local support for rock music, but with an attendance that still didn't reach three figures if you counted bands, guests and press, it seems that mud sticks and this show would surely sound the death knell for the festival. 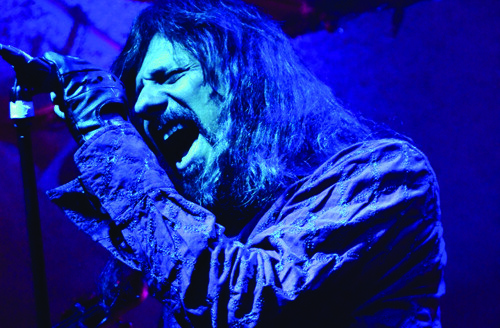 So, on a day when hardly anything went as planned, melodic NWOBHMer's Stampede set the scene for the day by turning up without rhythm guitarist Chris Clowsley, who'd had a motorbike accident the day before and broken his arm. With Lawrence Archer having left the band a few months ago it was down to 22-year old Rob Wolverson to carry all guitar duties as the band prepared to muddle through, the irrepressible Reuben Archer joking "At least there's no-one here to see it." To his credit Rob did a great job as the band ran through their UFO-like anthems, playing a longer set than billed, Reuben turning back the years with an impressive set of pipes and a fine head of hair. Stampede, completed by original bassist Colin Bond and drummer Steve Graystone, trotted out a good mix of old and new with 'Jessie', 'Days Of Wine And Roses', 'Send Me Down An Angel' and 'Hurricane Town' among the highlights. The lack of atmosphere did seem to affect them slightly but they still put in the work and got a good reception from the sparse crowd. The first real problem of the day was the non-appearance of Greek band Redrum's essential keyboard, with phone calls to keyboard players in the area not managing to secure a replacement for the particular model that had been lost at customs, so organiser Mark Alger made the decision to switch the band to the following day. It wasn't an ideal situation, especially as several people had told me they were just there for the Saturday and not Sunday, but with no announcement made about what was happening everyone was left in confusion, with a very long gap between Stampede and melodic hard rockers Shakra. To be fair the Swiss band took the delay in their stride and came across as a very professional outfit with a good look and a collection of simple, direct songs. 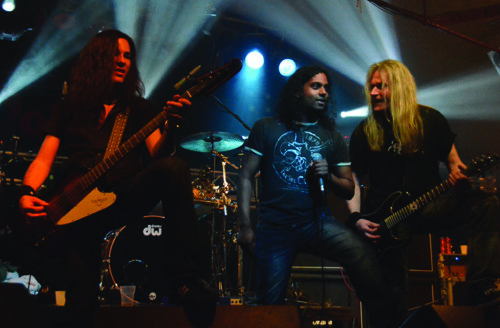 Similar to fellow countymen Gotthard's early material, and with hints of bands like Bonfire, Edguy and Crystal Ball, Shakra make all the right moves with a tight, powerful sound and perfectly adequate musicianship. I can remember reviewing their 'Power Ride' album a while ago but was shocked to learn that their latest album - 'Back On Track' - is actually their tenth, current singer John Prakesh joining them after their ninth; ‘Everest’. John has a powerful voice and guitarists Thomas Muster and Thom Blunier play some slick riffs and tidy solos, but songs like ‘Back On Track’, ‘Nothing To Lose’, ‘Yesterday’s Gone’ and ‘Ashes To Ashes’ are just as clichéd as their titles suggest and the band just left me cold, although others seemed to enjoy them. 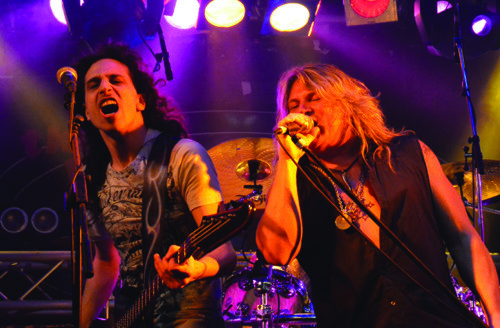 It’s on to Z Records’ own signings next with Legion, the collaboration between Bob Catley, Pulse & Eden guitarist Vince O’Regan and one man band Phil Vincent, and who’ve just released their third album in just eighteen months. 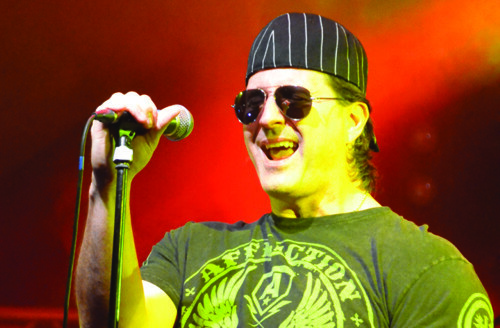 Again they’re joined by bassist Gavin Cooper, keyboard player Irvin Parratt and drummer Steve Hopgood for only their second ever show – their first was at last year’s Z-Rock. The good news is that Phil didn’t look as nervous, Vince wasn’t ill and the sound was good everywhere but on stage (apparently!) However, their Dokken-esque hard rock again came across as a bit sterile despite everyone doing their jobs, with the highlights being O’Regan’s fiery solos on upbeat rockers like ‘Last Time’, ‘Never Enough’, ‘Leave Me Alone’ and ‘Hard Times’. There were awkward moments between songs and hardly anything was given an introduction, which I guess is down to Vincent’s inexperience, but at the rate of one show per year it’ll be hard for that to improve. The songs were played well, and despite Phil’s complaints that he couldn’t hear himself, he sang quite well too. Another Z Records band doing one show a year are Arabia, last year’s surprise hit which sees flamboyant US singer John Blaze paired with a UK band consisting of former Ten & Vaughn pair Steve McKenna on bass and Lee Morris on drums, with keyboard player Irvin Parratt and guitarist Vince O’Regan retaking the stage after already playing with the last band. 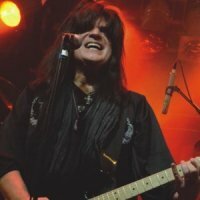 Blaze is a great frontman with a bit of Alice Cooper in his voice, rasping his way through a set that was remarkably similar to last years. Arabia have worked out a fine balance between upbeat rockers like ‘Heart Is A Lonely Hunter’ and ‘Welcome To The Freakshow’ and mellower moments like the power ballad ‘1001 Nights’ and the moody ‘No Place Like Home’. By the time they got to ‘Til The Day I Die’ Blaze wasn’t content for people to just watch so he jumped offstage and sang with them, before doing a quick and rather pointless costume change and reappearing for the Cooper-like ‘Last Temptation’ and a lively ‘I Wanna Be King’. The band seemed a bit more static than last time and were happy to leave the entertaining to Blaze, and as they finished off with the rather pointless ‘Brother Louie’ I couldn’t help thinking that last time’s element of surprise was what had made that set seem a little better. For me personally, New Jersey pomp/AOR maestros Prophet were the main reason I was here, and in terms of professionalism, great songs and musicianship they certainly didn’t disappoint. Beforehand I was worried about what the line-up might be and no amount of detective work turned anything up, so I was just expecting singer Russell Arcara and bassist Scott Metaxas, but was delighted that guitarist Ken Dubman was here too, alongside third album drummer James Callahan and with Bystander keyboardist Bill Dellicato replacing the great Joe Zujkowski, who is sadly no longer with us. From the moment they kicked into ‘Restless Hunger’ they were top-notch and exceeded all expectations, from the soaring pomp of ‘Street Secrets’ and ‘Power Play’ from the debut (the latter is the best Kansas song that Kansas didn’t write), to the glorious AOR of ‘Sound Of A Breaking Heart’ and ‘Can’t Hide Love’, the acoustic ‘Tomorrow Never Comes’ with Scott Metaxas on vocals, and the trickier musicality of ‘Cycle Of The Moon’ and breathless closer ‘Red Line Rider’. Everything was delivered as though these guys play them every day, rather than for just one warm-up show and this. Russell Arcara may look a lot different but the voice is exactly the same as he effortlessly belts out ‘Asylum’, ‘Streetfighter’ and a host of others, each with plenty of instrumental flourishes and impressive interplay between Dubman, Metaxas and Dellicato. Oh, and did I mention that the totally live backing vocals were impressive too? With Russell temporarily off the stage the rest of the guys display their impressive musical chops with the instrumental ‘Hyperspace’, and if that’s not impressive enough a note perfect rendition of Rush’s ‘Red Barchetta’ is the encore, and no, Metaxas and Callahan didn’t cheat, although I did have to have a friendly dig at Russell later for getting the words wrong. All in all it was an amazing set by a super tight band deserving of a much bigger audience. As we’ve learned from past festivals in this country, putting a legendary artist together with a band they’ve never met can be a bit of a lottery, so it was just a pity that none of Paul Sabu’s numbers came up. Completed by guitarist Linkan Andersson, bassist Martin Karlsson, drummer Lee Morris and a laptop, it was the laptop that proved to be the least reliable member of the band, resulting in one of the most embarrassing sets I’ve ever seen an artist struggle through. It was bad enough that the intro to opener ‘Angeline’ was started and failed more times than I can remember, but by the time the set eventually got underway the guys on stage were so shaken and angry that it was never going to work. Classics like ‘Just Ask’, ‘Heartbreak’ and ‘Scream Until You Like It’ should have had the crowd in ecstasy, but lengthy gaps between the songs while Paul switched guitars, or the laptop was set up for the next song, had the band members shuffling about nervously and half the audience heading for the exit. It didn’t help that Paul didn’t seem to know what to say and mostly looked at his feet or mumbled incoherently, but when they did eventually get into a song they were understandably a bit wooden. Sabu’s guitar was mostly inaudible but then Andersson was doing most of the solos anyway, with some of the songs from the new album sounding so metal and Paul’s voice being so gruff that, frankly, I couldn’t wait for it to be over. We got probably just over an hour of music in an almost two hour set. I can’t recall ever seeing any artist die like that on stage, never mind someone I like a lot. Nightmare doesn’t even begin to describe it. Entering the venue just after Sunday lunchtime I was surprised to see almost as many people (or as few?) 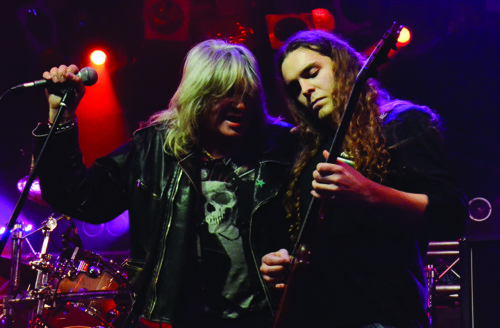 as the day before, and with more jiggling about of the line-up because Scream Arena had pulled out, young up-and-coming melodic hard rockers Summers came on well before their originally allotted time. However, the band from Southampton featuring brothers Crash Summers (vocals) and Ricky Summers (bass), guitarists Joedy Rose and Jason Sepala, and drummer Andy Pope, wasted no time in making people sit up and take notice. 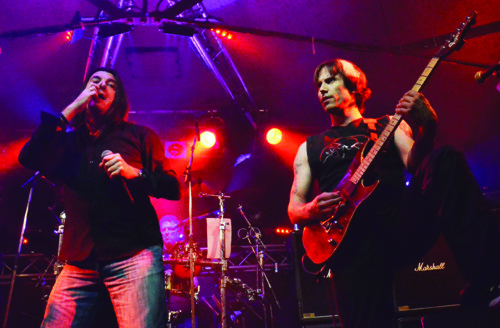 Opener ‘I Wanna Rock You’ was a statement of intent, the band throwing all the right shapes and dishing out catchy, no nonsense melodic hard rock with titles like ‘Girls’, ‘Steal Away’ and the excellent ‘Superhero’. As the set went on they showed some neat songwriting and Crash has great stage presence, so it was such a shame that so few people were there to see it. The band has loads of potential and plenty of time to fulfil it, just watch them go! For me personally, the highlight of the weekend was without doubt the set by Wildside Riot featuring erstwhile Wrathchild vocalist and the larger than life Godfather of glam himself, Rocky Shades. Because of the unannounced alteration to the line-up on the day, the band had to take to the stage an hour or so earlier. This seemed to have little or no detrimental effect upon the band as they sliced into their set with the determination of a marauding rhino, and despite the tiny attendance the band seemed to be having fun delivering their new material from their upcoming album. 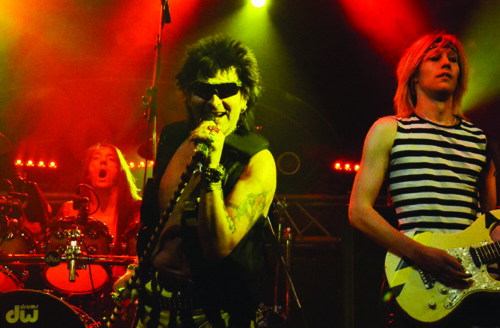 'Wildside Riot' and 'Broken Toys' set the tone for the forty minute set of hard rocking feelgood songs, along with 'Angel On My Back' and 'Wasted Lust', and there was a definite lump in my throat when Rocky introduced the immortal 'Trash Queen', dedicating it to me and Robbie Evans, which was followed by 'My Woman' bringing the set to a pulsating and satisfying finale. Rocky Shades seems to have surrounded himself with a fine ensemble of young, talented and very hungry musicians, and with so many quality songs in the band’s vaults it can only be anticipated that the new album will be an absolute killer!! As someone who was kind of involved on the periphery of the Gods festivals years ago, I’d already seen new Z-Records signings Hush a couple of times. The Norwegians were one of the casualties of the Frontiers/Now & Then break-up just after the release of their second album, and despite the fact that they released a third CD - ‘Mirage’ in 2006 - I was actually surprised that they were still together when they were announced for this festival. They’ve had a few line-up changes too in the last decade but singer/guitarist Patrick Simonsen and lead guitarist Kenneth Kristiansen are still there and they basically sound the same as they did in 2001, albeit a whole lot tighter live. The band work hard and Simonsen has a distinctive rasp to his voice as they work through the likes of ‘Is It Good Enough’ and ‘Heaven Ain’t’, and despite the fact that ‘Til We Become The Sun’ brings the tempo down, they’re certainly a lot more hard-hitting and contemporary than I remember. However, Simonsen’s voice has occasional Marmite tendencies, I don’t hate it but I’m hungry and I’ve heard there’s a decent carvery in the pub around the corner. I won’t waste too much space here on Paul Sabu’s effort to make amends for last night’s debacle by playing again, suffice to say that his set was rearranged to incorporate less guitar changes and the laptop had been threatened to within an inch of its life, but despite a much brighter start it didn’t make a whole lot of difference in the long run. They sounded better during the songs, but as things went on the between song pauses got longer and you could hear a pin drop, but at least the classic ‘Angeline’ got off the ground at the first time of asking. With things already running over an hour late and the missing keyboard having been hunted down, rounded up and tethered to the stand so as to not cause any more trouble, it was time for a double dose of Michael Bormann. The German vocalist had nothing to beat in following Sabu, but still made sure he beat it by the biggest of margins. Redrum are Bormann’s Greek band and are a lively and very ‘rock star’ looking bunch who make up for their unoriginality with a great deal of energy and fun. They’re good musicians and put in the kind of performance you would expect from a band returning for a home town gig after conquering the world, rather than a band trying to lift the spirits of fifty people who’d already lost the will to live after sitting through Paul Sabu’s set…. twice! Bormann may have put a few more pounds on, but there are few better live singers, and even fewer who can do it after hanging out and partying for a day and a half. To be honest most of Redrum’s songs sounded like something else, but ‘Ready For The Big Ones’, the bluesy ‘Too Good To Be True’ and the impressive ‘Lonely Lady’ (bookended by Bormann’s almost a capella version of ‘Ain’t No Love…’) showed exactly where their inspiration comes from. Michael is a showman and sings perfectly on ‘Heart To Heart’ and the hike in energy on ‘Judgement Day’ brings the Redrum section to a close. Having met the very pleasant guys from Swedish glamsters Bai Bang in the pub earlier, it was worrying to learn that their drummer had been forced to go home because of personal reasons. For most bands the options would be to do an acoustic set or not play at all, but luckily rhythm guitarist Jens Lundgren can play drums to a reasonable standard and they managed to get through it as a four piece. 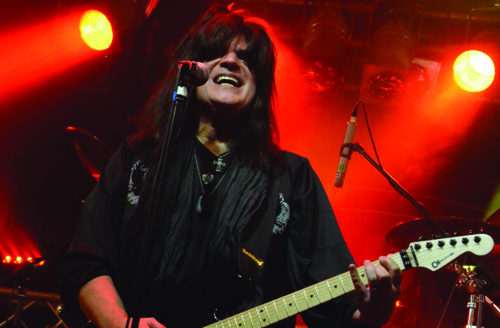 Despite sounding a little hollow with just one guitar, Pelle Eliaz did a fine job on his own and engaging frontman Diddi Kastenholt is one of those larger than life, instantly likeable characters who can carry the show on his own despite not having that strong a voice. There were a few moments where things sounded perhaps a little too loose, but songs 'Born To Rock', 'Party Queen', 'Come On' and the peculiar 'Put On Her Dress' aren't meant to be perfect. Bai Bang were a fun way to spend an hour. By this time things were running ridiculously late and it was well after 11pm by the time Newman hit the stage. Steve Newman is in the unusual position of having kept the same band together for a while now and they've gelled into an excellent live act. Dave Bartlett (bass), Nic Lipscombe (drums), Paul Boyle (keyboards) and Shaun Bessant (lead guitar) have obviously adapted so well that Steve can now just concentrate on being a good frontman, and his voice has improved no end. So from my vantage point it was interesting to see Prophet’s Scott Metaxas, Russell Arcara and Bill Dellicato move away from the bar to get a better view within seconds of the band launching into 'Killing Me' from the latest album. It also helps that most of the people still here at this late hour move nearer the stage as the likes of 'Every Moment' and the stage favourite 'Stay With Me' get a bit of a singalong going. The upbeat 'Primitive Soul' has become another stage favourite and keeps the energy levels up, whilst another couple of songs are perfectly dispatched before Steve announces that they have to cut their set short. The end song is the inevitable 'One Step Closer' on which Newman finally picks up his Les Paul and gives Shaun Bessant a run for his money, or at least he would if you could hear him properly. It's been a long day of waiting around for the guys but you get the impression that they would do it all again just to have their 45 minutes on stage. If Newman got short changed then Swedish hotshots Dynazty were positively robbed at gunpoint, finally making it onstage a mere half hour before the 1am curfew. Their six song set was still impressive enough, with some great twin guitar work from John Berg and Rob Love and the impressive Nils Molin hitting ridiculous notes with equally ridiculous ease. Their heavy rock sound verges on metal at times with high energy songs like 'Sultans Of Sin' and 'Hopelessly Addicted' recalling Skid Row at their peak, but when I mention to Scott Metaxas that Nils is like a young Sebastian Bach, he thinks he sounds more like a young Mitch Malloy. 'My Life' shows a subtler side to the band, and when they're told they only have time for one song left, they race through two, 'Land Of Broken Dreams' and 'Bring The Thunder', two frantic rockers that leave the few people remaining wanting more. Dynazty were obviously annoyed about being given so short a set, especially as they should have originally played much earlier and had waited around all day. Yet again the Z-Rock Festival was a mixture of line-up changes, constantly changing running orders and a very poor turn-out, but also there was an interesting collection of artists - some good, some great, and a couple just plain unlucky. As things stand this was the last ever Z-Rock, which is a shame as ten years ago it was in a healthy position with great line-ups and decent attendance, but in the last decade and a half I've always enjoyed it and have seen some bands that I never thought I would get the chance to see. You know what? Z-Rock 2012 was no exception.